Paleo Chocolate Cheesecake is a bit of a misnomer because the Paleo Diet, by definition, does not include dairy products. Cheesecake, obviously, has LOTS of cheese which may have you scratching your head. In strict Paleo Diet circles this recipe would probably be referred to as “Faileo” instead of Paleo. But here’s the deal, my husband had a birthday a few weeks ago and he requested cheesecake. He and I have been “paleo” for a few months and while I generally avoid dairy he does indulge in full fat Greek yogurt and heavy cream for his coffee. I searched around for a recipe in the “paleosphere” and did not find very much so I decided to come up with my own. I started out with Nigella Lawson’s recipe for chocolate cheesecake and modified it to be as close to Paleo as humanly possible. 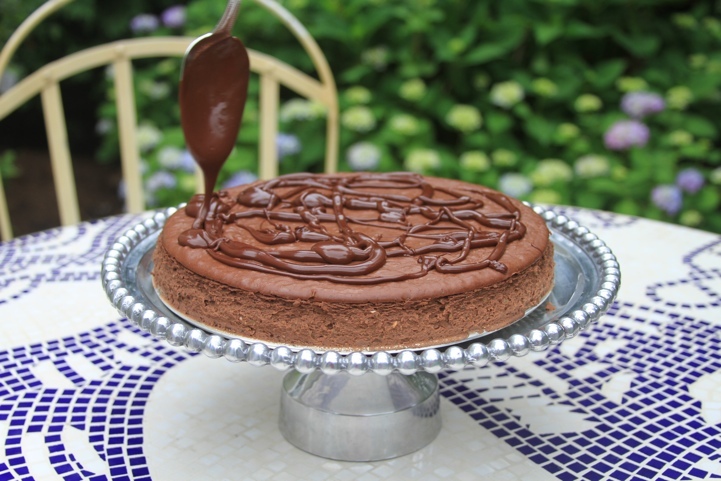 Voila’, Paleo Chocolate Cheesecake! My goal was to ensure the recipe would be completely gluten free, have a low glycemic index, contain full fat, organic cheese, pastured butter and omega-3 rich eggs. Instead of the graham cracker crust in Nigella’s recipe, I used almond meal in order to eliminate the gluten and increase the nutrition. Full fat Greek yogurt was used in place of sour cream to increase the protein content and thicken the cheesecake without having to resort to custard powder or cornstarch. The original recipe called for bittersweet chocolate but I used unsweetened dark chocolate to eliminate as much processed sugar possible. I substituted 1 Cup of Coconut Crystals for the 3/4 Cup of fine sugar called for in the original recipe. 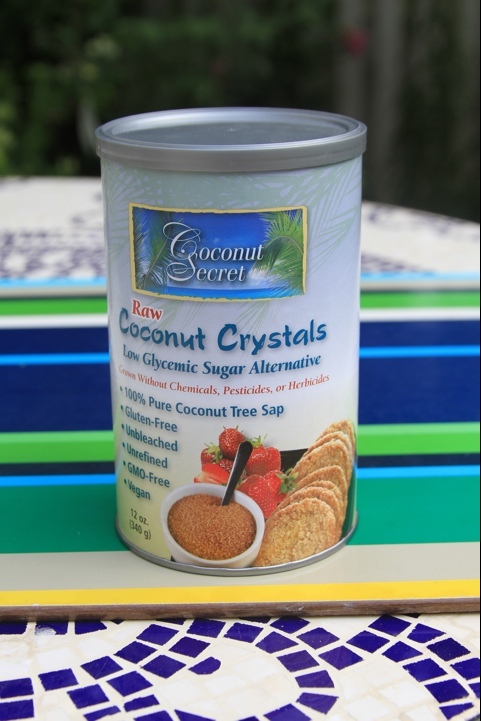 Coconut Crystals is a sugar replacement (not an artificial sweetener) made from the sap of coconut blossoms. It is very low glycemic (GI of only 35), diabetic-friendly, contains 17 amino acids, minerals, vitamin C and broad-spectrum B vitamins. By adding a full cup I compensated for the sugar missing in the unsweetened chocolate while keeping the overall glycemic level of the cheesecake fairly low. 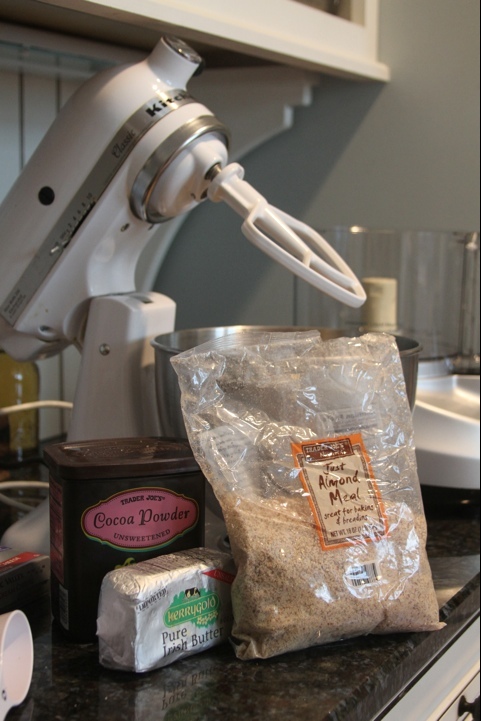 To make the base, in a food processor combine the almond meal, butter, cocoa and coconut crystals until it makes damp, clumping crumbs and then tip them into the pan. 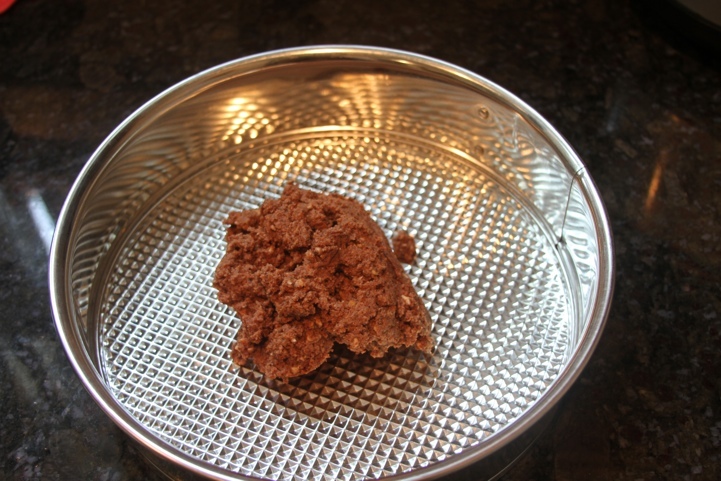 Press the crumbs into the bottom of the pan to make an even base and put into the freezer while you make the filling. 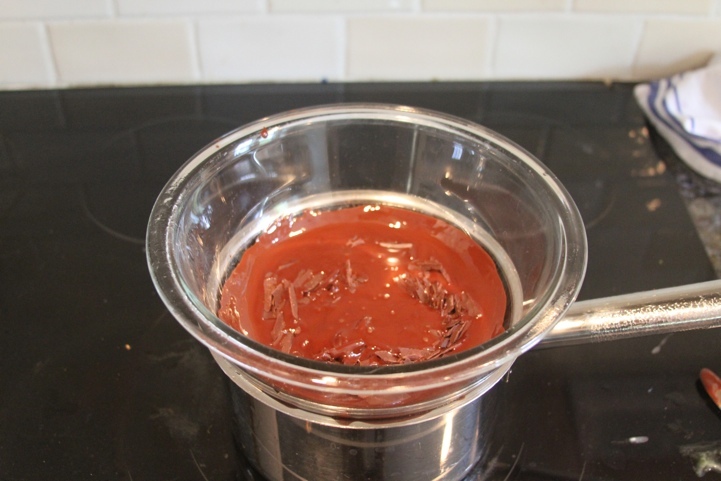 Melt 6 ounces of the unsweetened chocolate either in a microwave or double boiler, and set aside to cool slightly. Beat the cream cheese to soften it, then add the coconut crystals, beating again to combine. 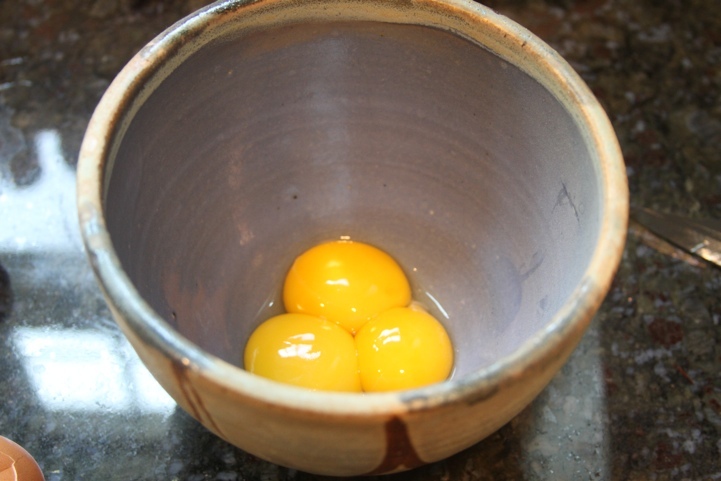 Beat in the whole eggs and then the yolks, and the Greek yogurt. 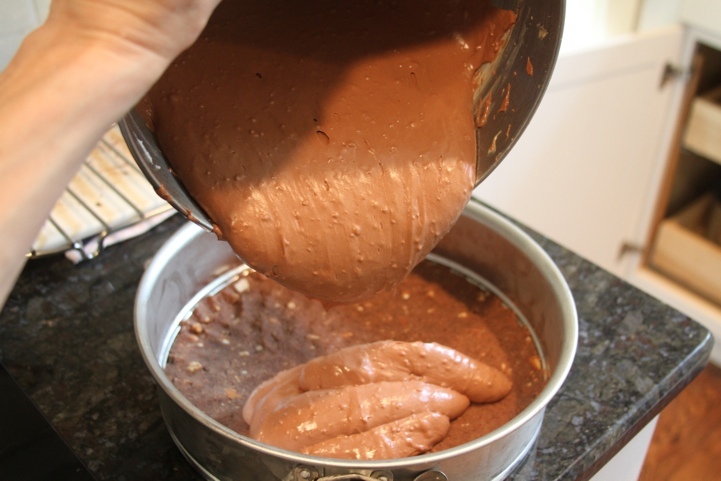 Finally, add the cocoa dissolved in hot water, the vanilla extract and melted chocolate and mix to a smooth batter. Take the springform pan out of the freezer and line the outside with a good layer of plastic wrap, and then another layer of strong aluminum foil over that. This will protect the cheesecake from the water bath. Pour the cheesecake filling into the pan. 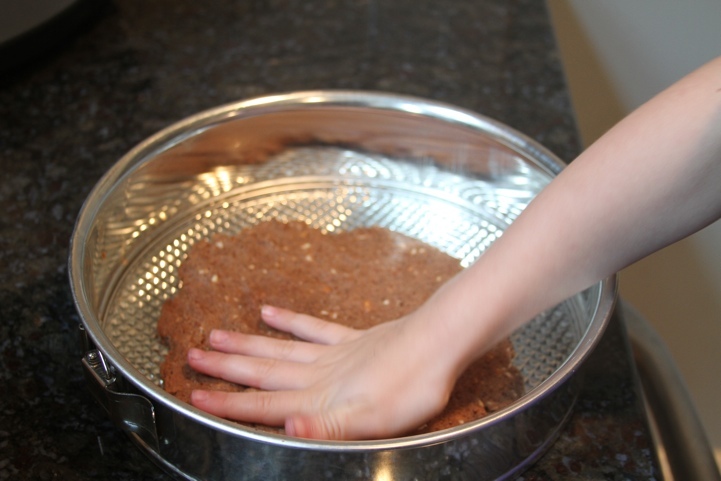 Fill the roasting pan with just boiled water to come about halfway up the cake pan. This will keep the oven moist and the cheesecake from cracking. Bake in the oven for 45 minutes to 1 hour. The top of the cheesecake should be set, but the underneath should still have a wobble to it. 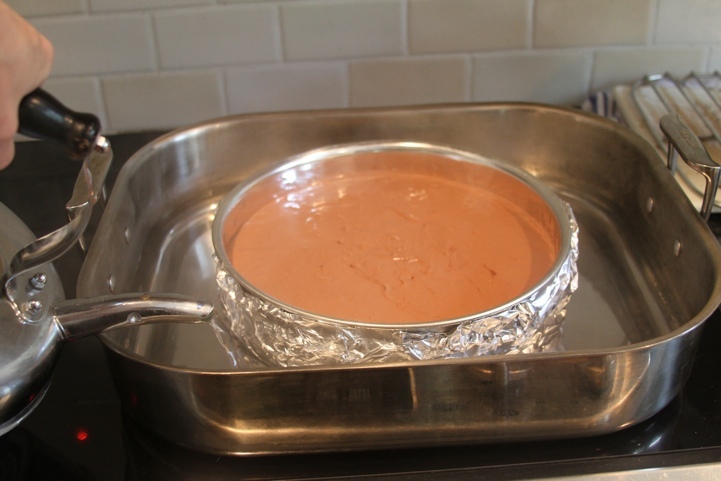 Peel away the foil and plastic wrapping and sit the cheesecake in its pan on a rack to cool. Put in the refrigerator once it is no longer hot, and leave to set, covered with plastic overnight. Let it lose its chill before unspringing the cheesecake to serve. To make the chocolate sauce: very gently melt the chopped chocolate, cream and coconut crystals. 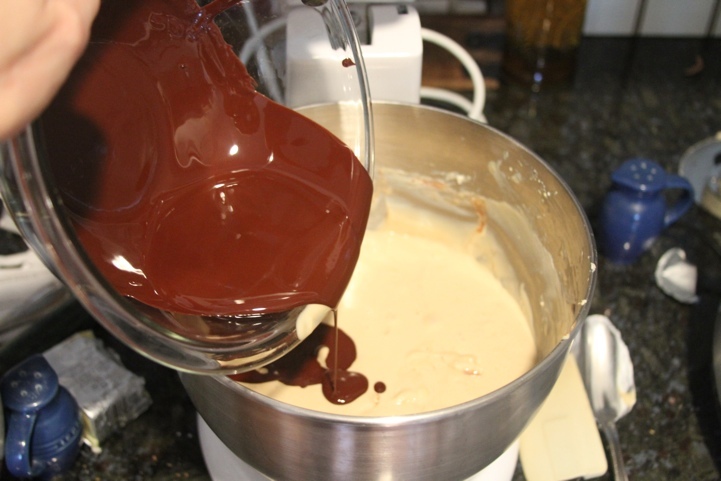 When the chocolate has nearly melted, take off the heat and whisk it to a smooth sauce. 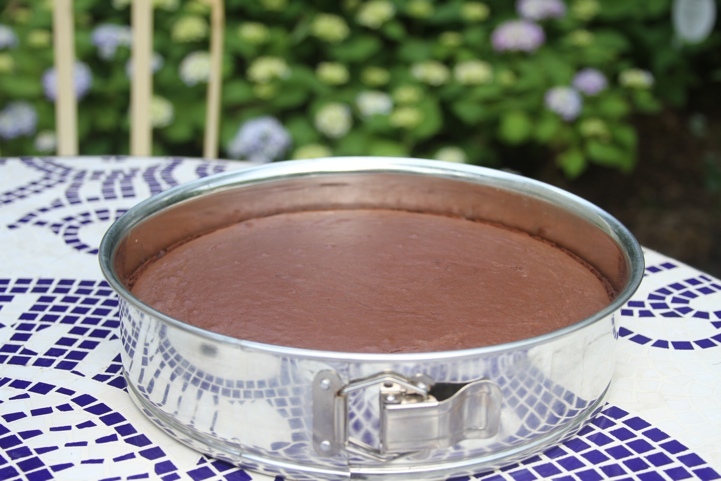 Let it cool a little, and pour it over the chocolate cheesecake on its serving plate. For this recipe I used very “high end” ingredients in order to max out the nutritional content and keep the GI very low. If I were to add up the cost it was probably on the expensive side. For me it was worth it for a special occasion and I wanted to experiment with these ingredients to see how close to strict Paleo I could get. But please don’t feel like you can’t try this recipe if you are not going to splurge on the same ingredients I used. It would be fine to use regular cream cheese and eggs and unsweetened chocolate. Obviously you can substitute regular sugar for the coconut crystals if you prefer. In my opinion the most important change was the use of almond meal instead of graham crackers in the crust. For anyone trying to remain gluten free this is extremely important. 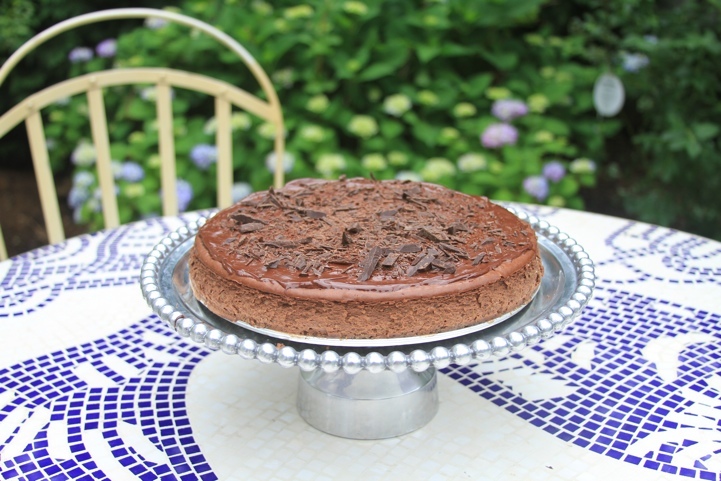 The Paleo Chocolate Cheesecake recipe was a bit of an experiment and I am pleased it turned out so well. We had a visitor from Australia with us the weekend I made it and he, in spite of not having an interest in eating Paleo, was very complimentary of the final product. It is an extremely rich dessert and I recommend eating smaller slices and then freezing any leftovers for future falls off the non-dairy wagon. 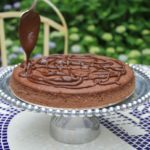 39 Responses to "Paleo Chocolate Cheesecake"
I’m always looking for an exciting new resource when it comes to paleo recipes. Thanks for sharing! Looks yummy will be making for my daughter’s birthday. Just so you know you left the amount of sugar added to the cream cheese mixture out of the recipe accept I see that it is mentioned on the top commentary…….. so all is well. Brenda, I really appreciate your letting me know that! Thanks and I hope it turns out well for your daughter’s birthday. Hi. The recipe looks super yummy. I’d like to do mini cheesecakes with the recipe (ya know…the small ones that are put in a mini cupcake pan). For how long would I bake those? Thanks in advance! If you are cooking it in muffin tins with liners I would say reduce the temp to 275 degrees and cook about 20 minutes. The centers should be set but still a little wobbly. You said mini cupcake pan so that would be even smaller. I’m not sure how long that would take. The other thing is you might want to cook the tins with the crust for a few minutes and cool before adding the cheesecake batter. I have seen other recipes that recommend that. I have not tried this recipe in any other pan. I would be interested in hearing how yours turns out. Good luck! I love coconut crystals. I hope it works out for your Dad’s birthday. I made this and it was divine! I had a couple small changes but for the most part followed your recipe. YUM! It’s been a while since I made this one and I’m glad to know it turned out well for you. I think it’s time I tried it out again. I made this today, and just finally got to eat a piece. DELICIOUS! I dislike crust to begin with, so I left the almond “meal” a little more coarse just so it would break up all the creaminess. I also didn’t make the sauce for on top. I love a nice bitter chocolate, and this is just sweet enough for me, and it isn’t super sweet. A small portion is a great fix, and the coconut sugar is amazing for everything. Congratulations on success. It’s a bit of a process so I’m really glad you liked it. Thanks for taking the time to give me feedback. It’s great to hear. What do you suggest I do for the crust? Do you think the one you made would work? Would it maybe be better with all hazelnuts for the crust? Also, there are no coconut crystals where I live so if you can suggest an alternative I’d really appreciate it. Thanks in advance, can’t wait to make it!! Hi Theodora, I feel more educated after your comment because in looking at Nigella’s recipe I ended up having to research the meaning of “digestives”. Those are similar to graham crackers I believe. My crust recipe would probably work for the nutella cheesecake and I think ground hazelnuts could be used. You might have to play with the amount of butter to ensure you have a crust that is not too wet. My cheesecake goes in the oven, whereas the nutella one does not, which might make a difference. As for substituting for the coconut sugar, I think you could use brown sugar in its place. I only had 1 Tablespoon in my crust recipe which makes for a crust that is really not very sweet. It depends on your taste but the rest of the nutella pie sounds pretty sweet so you probably won’t miss it. Good luck! Hi Lea, just wanted to let you know that I made this for my birthday the other day and it is AMAZING! In case you want to make it, and I highly recommend you do, I used a total of 275 grams of mostly hazelnuts, but also some pecan nuts, almonds and raw cashews for the crust instead of the cookies, less butter (50 grams) and then followed the rest of the recipe. I mean it has sugar and dairy but at least no grains, so it’s kind of paleo! And it tastes extraordinary! Wonderful. Thanks for letting me know. I hope you had a happy birthday. It’s not a dumb question at all. I think the main point of the water bath is to keep the cheesecake moist. So you could try putting a pan of water in the oven with the cheesecake pan (not submerged like I show in the recipe.) I have seen this done with other cheesecakes to ensure there is enough moisture in the oven to keep the cheesecake from cracking. I have cooked other cheesecakes that way with success, just not with this particular recipe. Good luck! OHMYWORD, Lea!!! I have to tell you, this is the first Primal recipe I’ve ever made that EVERY SINGLE PERSON that ate it absolutely raved about it! It was DIVINE. I was so excited because there’s always at least one person who doesn’t like what I make…but cheesecake? Everyone was willing to try it, and they all LOVED it! As did I. 🙂 Just wanted to share that awesome information with you. This was the first recipe of yours that I’ve made, so I’ll definitely be making more. Can’t wait to try those Apple Cider Doughnuts! & I think this is gonna make an excellent base recipe for trying other kinds of cheesecake…I’m thinking a sunbutter version. Mmmm. Yay Chrissy! I’m so glad. Thanks for letting me know. You’re right, those ingredients are expensive so you don’t want to get it wrong. Let me know if you try a sunbutter version. We’ve only recently discovered sunbutter in our house so I’ll be interested to hear. 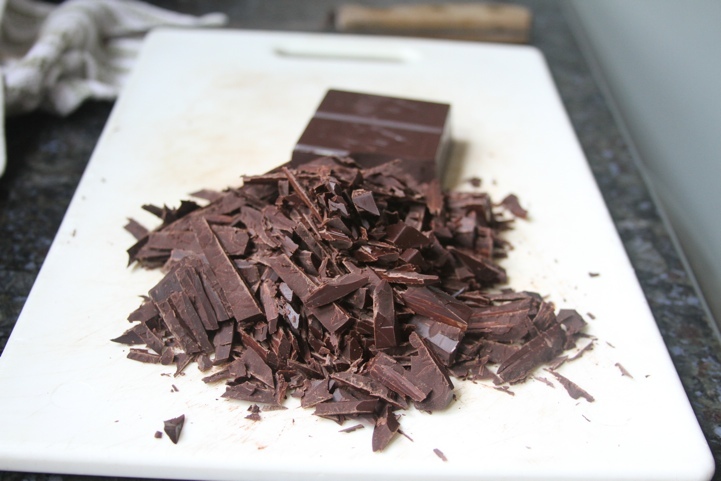 You could probably make your own chocolate with butter and cocoa powder. I would imagine a good ratio of oil to cocoa might be 2:1. This recipe calls for 6 ounces of chocolate so a full cup of butter + 1/2 cup cocoa + sweetener would probably result in too much chocolate. I suggest you try an internet search for the best ratio oil/cocoa and then only add the required amount for the recipe. I’ve never made my own chocolate the way you describe but I’ll bet it would be fairly easy to do. Good luck! Plenty of people on the paleo diet eat dairy. The deal is that everyone should eliminate it for at least 30 days then, if you choose, you can reintroduce it to your diet and see how you feel. 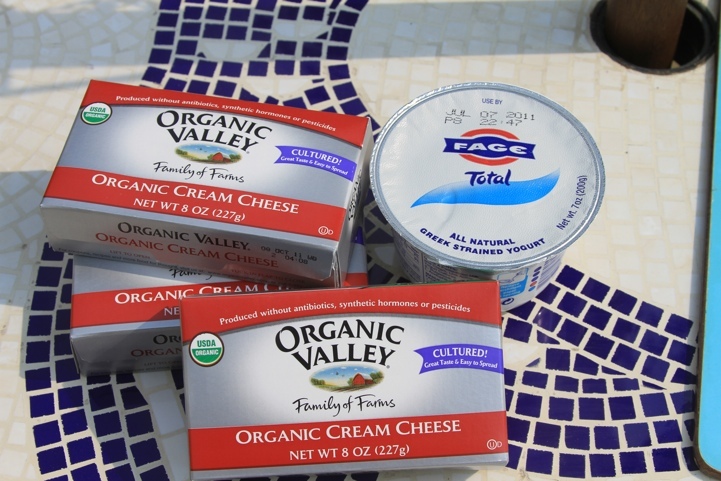 Check out this article (below) on Mark’s Daily Apple where Robb Wolf gives his thoughts on dairy. Many people cannot tolerate dairy and they should avoid it. But others who follow the paleo diet and find they tolerate dairy, after an elimination period, choose to eat it. That is why this website contains recipes with and without dairy or with recommended dairy alternatives. This isn’t paleo since there’s cream cheese, heavy cream, and greek yogurt? It looks amazing, and I love cheesecake don’t get me wrong…but this definitely isn’t paleo.. I spoke to this in the text of the post. And technically it is paleo for people who tolerate dairy products. Read Rob Wolf’s book “The Paleo Solution”. If you don’t eat dairy then obviously you wouldn’t make this recipe. This looks amazing and I cant wait to try it! Thank you for experimenting and posting this! I like all the detail and pictures! Great directions, too. Made it yesterday for my husband’s birthday! Turned out just like the picture and was delish! Very decadent! Couldn’t find unsweetened dark chocolate so I used a good quality high cocoa chocolate and just reduced the sugar to 3/4 cup and added no sugar to chocolate sauce topping. Also added a raspberry puree’ for kicks. Really, really good! Will serve 1,000 (HA! )…it’s soooo rich. Thanks for the great recipe! This looks wonderful! Could you clarify the chocolate sauce ingredients, please? If I’m reading correctly, it says 2 tablespoons of sugar in one place, and a cup of sugar in another. Thanks so much! I checked the recipe and it shows 1 cup of coconut crystals (sugar) in the cheesecake filling and 2 tablespoons of it in the chocolate sauce that is then drizzled on top. I hope that helps. Just finished making it! turned out great…massive thanx! Yes everyone has the choice to consume dairy… but if they do they are NOT ON THE Palaeolithic DIET. Recipe’s such as this are incredibly misleading to people who are trying to improve their health by starting out on the Paleo diet, and reach out to so called ‘Paleo resources’ to find healthy alternatives to popular desserts. But the simple fact is if it has dairy = it is NOT Paleo. And quite frankly if you try to assert that it is, when it contains cream cheese etc. … then you are not a reliable source and either do not understand what the Paleo diet is at its core – or you are being deliberately misleading. This looks delicious. But it is a cheesecake, NOT a Paleo Cheesecake.